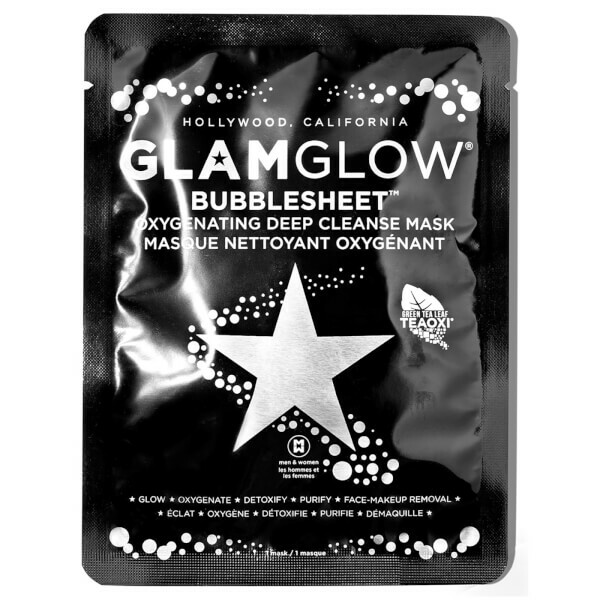 Experience next generation cleansing with the GLAMGLOW Bubble Sheet Mask, an innovative face mask with cleansing and detoxifying properties. Infused with Charcoal and Green Tea TEAOXI®, the bamboo sheet mask activates on application; it oxygenates and creates a 3D bubbling sensation to deeply cleanse and invigorate skin. 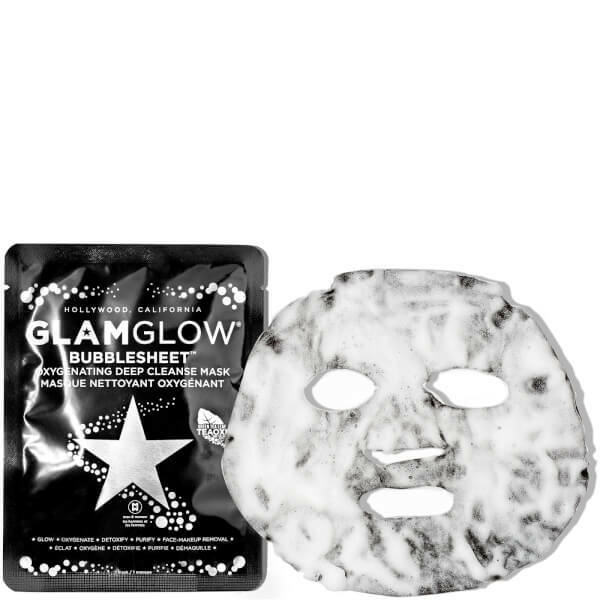 Effectively removing makeup and impurities, the weekly, detox sheet mask will leave the complexion looking glowing and purified, in just three minutes. Unfold mask. Dampen face. 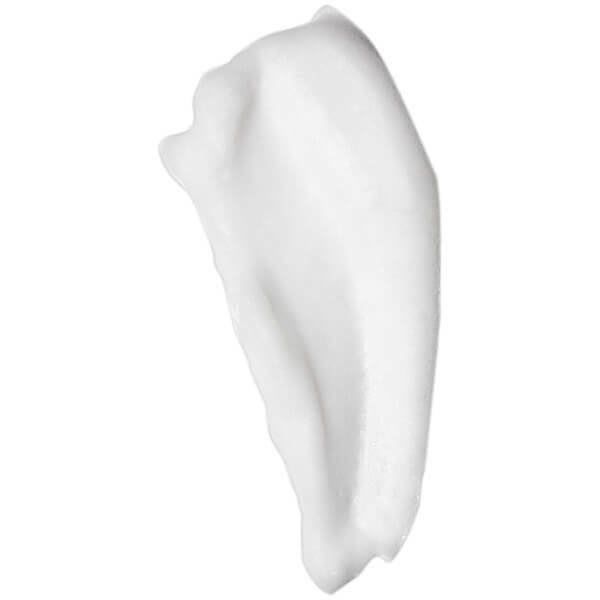 Place onto the entire face and align with the eye and nose area. Smooth all around the face. The oxygenating micro-bubbles will start to form within 60 seconds. Leave on for approximately 3 minutes. Remove mask and gently massage face with remaining cleansing bubbles. Rinse clean. Water\Aqua\Eau, Glycerin, Methyl Perfluorobutyl Ether, Acrylates Copolymer, Cocamidopropyl Betaine, Disodium Cocoamphodiacetate, Lauryl Glucoside, Retinyl Palmitate, Allantoin, Arginine, Camellia Sinensis Leaf Extract, Helianthus Annuus (Sunflower) Seed Oil, Ascorbyl Glucoside, Ethylhexylglycerin, Ceramide Np, Sodium Pca, Sodium Chloride, Saccharide Isomerate, Polyquaternium- 10, Potassium Cocoyl Glycinate, Potassium Cocoate, Hexylene Glycol, Butylene Glycol, Citric Acid, Hydroxyethyl Urea, Citrus Limon (Lemon) Peel Oil, Limonene, Citral, Sodium Citrate, Disodium EDTA, Phenoxyethanol.